Coton is a small village and civil parish about two miles (about 3 km) west of Cambridge in Cambridgeshire, England and about the same distance east of the Prime Meridian. It belongs to the administrative district of South Cambridgeshire. The parish covers an area of 392 hectares (970 acres). In the 2001 census it had a population of 773, with approximately 336 dwellings and 322 households. Coton is approximately bounded to the north by the A1303 Madingley Road, which forms part of the Cambridge to St Neots road; to the west by open fields which separate the village from that of Hardwick; to the south by open fields separating it from Barton and to the east by the M11 motorway, which divides it from the city of Cambridge and, to the south-east, the village of Grantchester. Coton lies roughly equidistant from junctions 12 and 13 of the M11. Coton is not mentioned in the Domesday Book, as the land forming the village belonged at that time to Grantchester. However, in the Middle Ages, Coton became a separate parish. 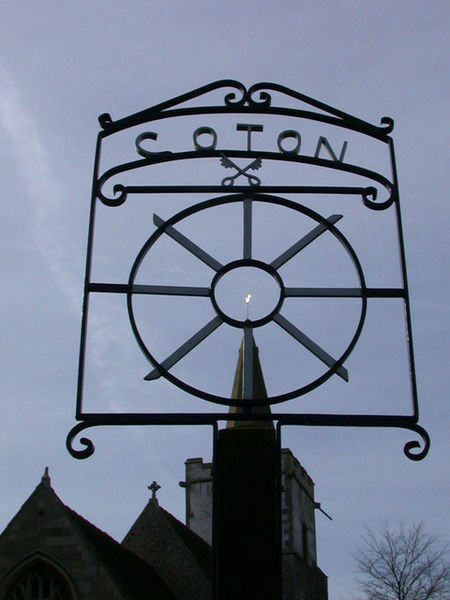 There are no references to a separate Coton population prior to 1500, but by 1563, 21 families are recorded as living in the village. The population grew slowly over the next two centuries, reaching 126 by 1801 and then more than trebled to 390 during the 19th century. Further population growth came in the 1940s, when an estate of Council houses was built at the west end of the village (Whitwell Way) and in the 1960s, when further houses were built between the High Street and the 1940s estate. In addition to its church, Coton has a primary school, a restaurant-pub , a garden centre containing a Post Office, farm shop and cafe, football, cricket and bowls clubs, and a ladies group whose name sounds like a gaming console as well as other local clubs. The cache is nowhere near the village sign so please do not go climbing all over it!